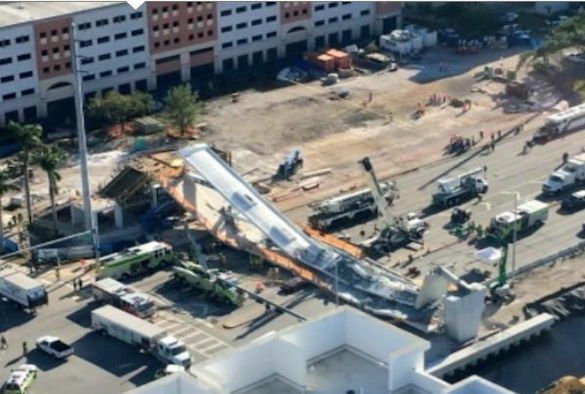 Bridge Engineers around the world will be following the news for any clues as to why the new footbridge at Florida International University (FIU) collapsed on Thursday. The bridge was still under construction and the part that collapsed was the first of two spans that were eventually to have additional cables supporting both spans from above. At the time of collapse neither the second span nor the cables were in place. Bridge collapses are very rare to the extent that when one does occur it usually has tragic consequences and makes international news. A major reason that such collapses are so rare dates back to the early 1970s when a number of major box-girder bridges collapsed within months of each other. These events led to extensive changes in the way that bridges were designed. New design standards were developed, but the most significant change was the introduction of the requirement for all bridge designs to be checked by independent Bridge Engineers. These checks were not just of the calculations but also of the structural concept and the construction method. I have been involved in many of these checks and it is not usually the main structural members that are found to be incorrectly designed but usually details relating to temporary support or the like. Because of the consequences of failure, Bridge Engineers are a fairly conservative bunch and are usually wary of innovation. Two innovations that have been mentioned already relating to FUI are the fact that it was prefabricated and that it was built using “accelerated bridge construction”. The implication is that these developments may have contributed to the collapse. They may have done but generally to prefabricate major bridge elements is a good development in terms of safety and the quality. It means that construction take place in more favourable conditions and overall causes less disruption to traffic. So these new innovations should not be dismissed, although care needs to be taken to check the stability of the bridge at every stage of construction. The FUI footbridge appears to be an innovative design. It is quite unusually to have a single line of vertical bracing down the centre of the bridge. Normally there would be two of these down each side of the bridge. The traditional arrangement provides bridges with torsional stability so one of the questions that will be asked is how that stability should have been achieved in the new design. Over the next few weeks there will be extensive investigations to try to answer the question ‘Why did this collapse occur?’ That investigation will look at the design process, the construction methods and the materials used. Bridge Engineers will be as keen as the lawyers to find the answers because we need to learn from this tragedy, disseminate the reasons and change design/construction processes as necessary.